Workers began digging two giant access holes on either side of the river in 2013, and actual tunneling started last summer. NEWBURGH, N.Y. (AP) New York City is in the midst of a plumbing repair job of monumental proportions. 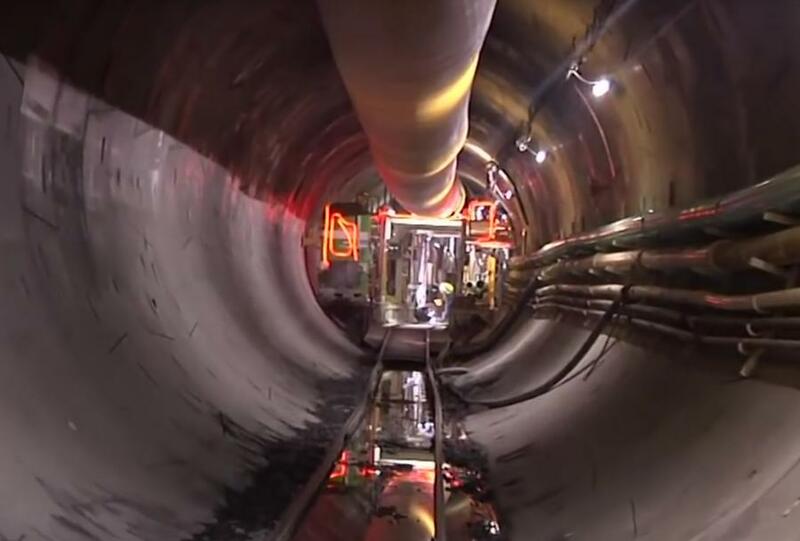 Hard-hat workers are toiling deep underground, 55 stories beneath the Hudson River, to eliminate gushing leaks in an aging tunnel that carries half the city's water supply more than 85 mi. from Catskill Mountain reservoirs. Using a cylindrical, space-rocket-size borer, they are carving through solid rock to create a 2.5-mi. bypass tunnel around the worst of the leaks. When they finish the $1 billion tunnel in 2022, the entire Delaware Aqueduct will be shut down for months to prepare for the diversion. And if they do it right, New Yorkers turning on their faucets will never even notice. The Delaware Aqueduct is to the city what the aorta is to our circulatory systems: a necessary channel to keep everything running. It was drilled and blasted out mostly during World War II and carries about 600 million gal. a day, entirely by gravity, from four Catskill region reservoirs to a holding reservoir just north of the city line. Along with the complementary Catskill Aqueduct, the two help connect a complex system that serves 9.6 million people in New York City and upstate municipalities. Engineers and politicians compare the network of 19 reservoirs, three lakes and connecting tunnels to the grand aqueducts of ancient Rome. But the Delaware Aqueduct is showing its age at a weak point where it crosses through limestone beneath the Hudson River near Newburgh, N.Y. Limestone is less dense and has more “give” than the neighboring shale, so crews protected that length of the concrete tunnel with a steel sleeve. But for an unknown reason — lack of foresight, lack of steel during wartime — they did not extend it through the entire limestone formation. Leaks formed in that gap, with some of the water burbling up into the river. About 18 million gal. — 3 percent of the aqueduct's flow, or enough to fill about 27 Olympic-size swimming pools — escapes from the pipeline every day. The loss is too big to ignore, but the tunnel is too vital to simply drain for a multi-year repair. City officials eventually settled on the parallel bypass tunnel, which allows for a shutdown measured in months instead of years. “We couldn't fathom shutting down the tunnel,” said Paul Rush, deputy commissioner of the environmental department. A long, cylindrical machine nicknamed “Nora” presses into the rock face with a spinning 21.6-ft. diameter “cutter head” embedded with 41 spinning, steel blades. The tunnel boring machine, the sort used worldwide for major water and transportation projects, is named for civil engineer Nora Stanton Blatch Deforest Barney. The pulverized rock comes out the back via conveyor belt to be loaded onto rail cars and hauled topside. Dozens of workers are deep down at a time. They work Nora's controls, bolt together pieces of the ever-lengthening concrete tunnel, operate rail cars and tend to material going up and down the 900-ft. shaft. It's a construction site in a cave — and a wet one. Miners are constantly sloshing through puddles from the seeping groundwater. Draining the aqueduct in 2022 will give crews time to reroute the water under the Hudson and to seal other leaks some 25 mi. up the aqueduct. Those losses in Wawarsing, N.Y., are far smaller, but they did contribute to a local plague of flooded basements and sodden lawns that resulted in the government buying some homes. Cutting off half the city's water supply for up to eight months sounds like a recipe for disaster, but the environmental agency has been preparing for years. Conservation efforts, like the installation of low-flow toilets, have contributed to dropping water usage rates even as the city grew. The city will rely on water from reservoirs in suburban Westchester County and the Catskill Aqueduct, which should have a higher capacity by then. That aqueduct will be shut down for several 10-week increments so crews can scrub out microorganisms that have created a layer of “biofilm,” which inhibits the flow through the century-old tunnel. By 2023, water will flow through a bypass built to last. A layer of steel will be fitted inside this tunnel and then another layer of concrete added for a final 14-ft.-diameter tunnel, all the way through the limestone formation. 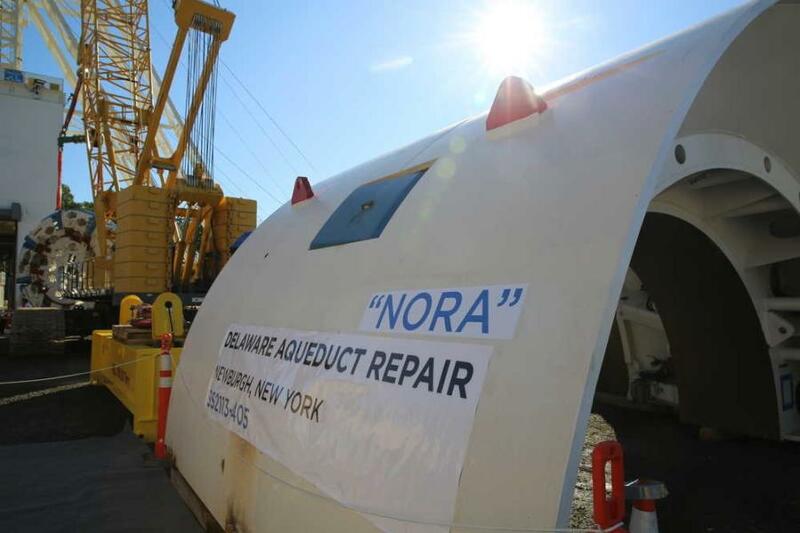 Click here to read more about "Nora" and the Delaware Aqueduct project.